The SWAT Tactical Glasses from Bolle provide premium ballistic protection and are certified to meet NATO's demanding STANAG 2920 and EN172 standards. The ballistic polycarbonate lenses are tested against impact from a steel cylinder equivalent to a .22-caliber round. Integrated lateral protection improves the lens overall strength and protective coverage ability. The lenses feature anti-scratch and anti-fog coatings to prevent surface damage and maintain visibility in all weather conditions. Bolle's flexible and lightweight nylon frames guarantee maximum comfort and include non-slip temple and bridge sections to keep them securely on the face. 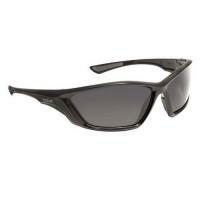 Lenses are available in smoke grey, silver flashed and polarized options.